Tomorrow, the 10th of march, it will be exactly one month since I’ve started my trip! I still can’t believe it. I’ve had troubles with my connection from day one, and for this, and many other reasons, I wasn’t able to update my blog, even though I missed writing in here so much! This first post from Asia is a recap of the main facts and figures of the past 30 days. I’ll try to fit everything in the hour or so that I have left before leaving Bangkok. My initial plan was to write a monthly recap with the names, dates and places, to track down what I’m doing and my expenses in a easy way, but I guess I won’t be able to keep up with that. In one month I experienced so many emotions and I have so many contrasting feelings that I feel overwhelmed and I’m now in the process of “digesting” this big twist of feelings, and getting ready for many others to come! Tomorrow morning I have a very early flight to Phnom Phen, Cambodia, final destination: Siem Reap to admire the incredible Angkor Wat temples. The whole Cambodian trip will only last 4 days, and it’s our first “visa run”, as the Thai one is expiring and we needed to get out of the country to get other 30 days. Around 1100 USD, so happy that we made it! our planned budget was around 20-25£ per day including everything, and counting the activities, transportation, food, entertainment and drinks, we did a pretty good job! there is still room for improvement but being this the first month I’m impressed. Khaosaan Bath thai Bangkok: not bad, cheap, with a balcony and a nice common area. Downside: no air con, we were MELTING! Lime ‘n Soda resort (Bungalow) Koh Phangan: Great atmosphere, nice beach front with swimming pool and finally sunsets on the beach! Grand Tower Hotel , Krabi Town: so cheap and a good base for our activities, nice sunset view and close to my favorite river! Downside: no air con and 5 floors with no elevator. K.S. Guest House Bangkok: Cheap and close to Khaosan Road, but hot as hell. 1 debit card stolen, 1 t-shirt, 1 box of medicine, 1 tripod, 1 hair straightener lost on the way, not bad. Three more months and my backpack will be empty! Chiara and Daniele in Bangkok : we met them on the plane, and they convince us to join them to the beaches instead of going to Kanchanaburi as planned. Really friendly and nice, we had a great time with them in Bangkok! Goson’s Thai Family in Bangkok: we met them while walking close to the river, they offered to host us for a couple of days, and gave us their contacts in case we needed help or anything. I was surprised by how they trusted us so quickly (and vice versa).That’s what I like about my trip! Matije, Michel, Andy,Max, Haly, Lars, Janina, Dana in Koh Pagnan : we met them at Lime ‘n Soda Resort and they definitely spiced up our trip big time! My favorite Thai pizza Owner in Krabi: I don’t remember his name but he was quite a character, and his look resembled the ones of a native Indian American. And what a delicious Pizza! Motorbike rides in Koh Phangan from Thongsala to Haad Riin beach :Koh Pangan roads are scary but so much fun! the hills were so high that I had to get off the scooter a couple of times as it couldn’t make it all the way up! Finding a desert beach in Koh Phangan by accident and get “trapped” in a tropical rain storm for a couple of hours: We felt a lot like “survivors”, we found shelter under a hut surrounded by coconuts and palm trees, showering and drinking the torrential rain with an empty bottle of water, and laughing non stop! I’ll never forget that day! Night taxi boat ride in Koh Phagnan: we were going back to Thongsala from the Guys Bar, a secluded place reachable just by boat, after a dancing night in the middle of the jungle (scary ride, as the guy kept on filling an old broken bottle with gasoline every 5 minutes and spilling it all over), then soaking my trousers and shoes up to the knee, to get off the boat and before that, trying to find our way to the boat in the middle of the night in the jungle. A night conversation I had with Matt, on the border of the swimming pool in front of the beach. Talking about life, religion, society and all sorts of topics… That was one of the highlight of my trip. And since it wasn’t expected, I value it even more, as it’s not easy for me to find people with whom I can connect so easily. I didn’t have this kind of fluid, relaxed conversation in a very long time, and I’m grateful that i had such an amazing time. The breath-taking pool view from the first resort in Koh Phangan, with a Jacuzzi that I used non stop for 5 days in a row: My night swims in complete darkness in the pool, looking at the moon, the stars and the distant lights of the boats floating on the sea..only me and my thoughts. Such a peaceful feeling. My first Thai Massage in Bangkok. AMAZING! The scariest Tuk Tuk ride ever in Bangkok: I thought the motorbike was scary enough, but I hadn’t try this crazy driver yet! I thought I was about to die 4 or 5 times in half an hour! Finally Sleeping in a Canopy bed: which was one of my dreams for ages, I even wanted to build one whilst living in London. Jumping in a jungle pool with a rope for the first time: It was a bit scary in the beginning, lost my contacts, but it was so much fun! Maya beach: Even packed with tourist I found it spectacularly beautiful. 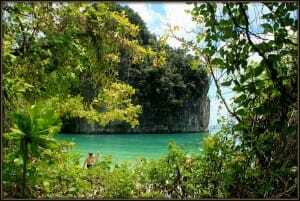 Kayaking inside the caves in Krabi: and finding a huge pool with still water surrounded by majestic high rocks full of wild jungle trees and mangroves. A scenery that I will never forget and that’s not easy to describe, you feel so tiny compared to nature and the pictures don’t make any justice to the quiet magnificence of the place! I hope I didn’t forget anything. As you can see my first month has been in the middle of a “vacation” and a “trip”, we experienced the “luxury” of the resorts and their amenities but also tried to mingle with the locals, eating local food, and trying to figure out how to get the best from this experience. I’m really curious to see how all this will develop in the next couple of months! So now you have an idea of what I’ve been up to for the past 30 days! I hope you enjoyed my rants as usual and more posts to come very soon!